If you read my blog or follow me on Twitter, you know that I run an inquiry based program (most of the time). I also let my students choose what apps they use when explaining their learning. We all have favourite apps that we use. My students do too. I give them the opportunity to try different content creation apps out and have them available. The ones they choose to use is up to them. It has been a frog frenzy in my room the past couple of weeks. It all started when I brought in 7 tadpoles (and a crayfish that we didn't see until a week later) that my family and I caught in a ditch near our house. We have tweeted about them, we have a live webcam set up on my class website because my students wanted to show their peers on Twitter and be able to check up on them while they were at home. We also have done a lot of research about them. student in my class brought in a toad.... in a little cage. 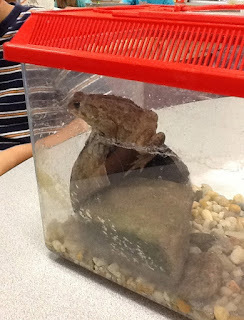 A rather large toad.... my students wanted to name the toad and keep it as a class pet. First of all, it is against board policy to have any pets in our classroom. Besides that, I felt bad for this little fella. How was I going to persuade my class to let this toad go? I wanted the decision to come from them, not because I told them no. I decided it would be a great way to get a little more science curriculum in and teach about habitats. 2. What kind of habitat does a frog/toad need to survive? I am happy to say that our little friend the toad, (we did not name him) was let back into his original habitat that day. It took less than half an hour of research and discussion for one of my kiddies to share with the class that we needed to let our toad go because the cage that we had him in was not an adequate habitat for him. Hallelujah! My students came up with the reasons and the decision on their own to let the toad go! I didn't have to be the bad guy and tell them that we couldn't keep the toad! I wanted to continue the conversation and research we had begun on habitats. 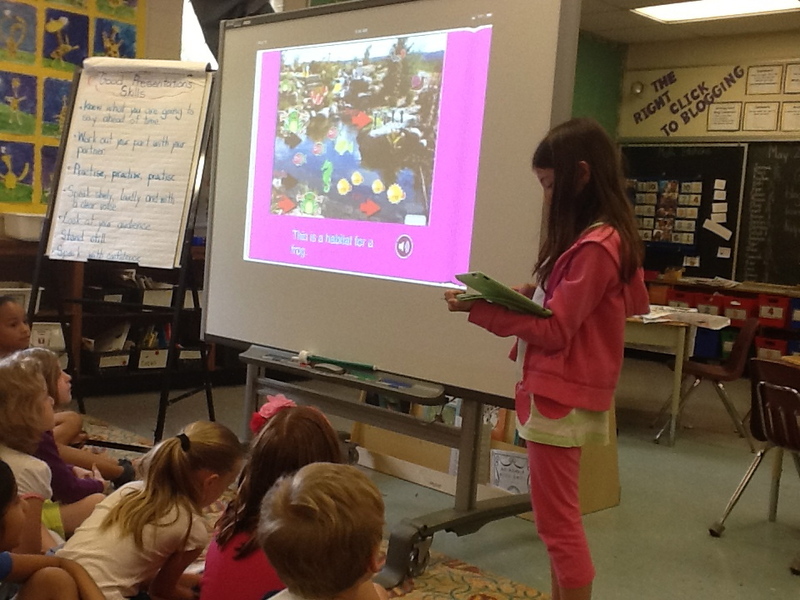 The students agreed and wanted to share what they had learned about habitats. I told them that they could share their learning of habitats in any way they choose. The only stipulation was that they needed to answer the two essential questions. I figured this would take 2 days. One day to create the project and one day to share. Well, for 4 straight literacy classes, my students were focused, were engaged and were amazing! 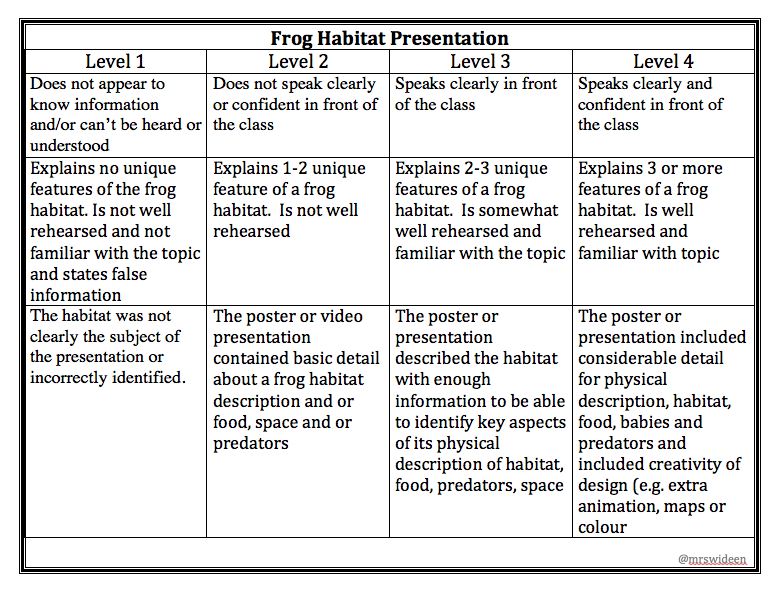 Each morning I would do a short mini lesson, one day it was on presentation skills, one day it was on habitats, and one day I showed them the rubric I created, that I would use to mark their presentations. I had grade 1 students writing little sticky notes to remind them what to talk about during their presentations. I had other students who chose to use chart paper and drew a huge picture of a frog/toad habitat, with labels and notes written on the back so when they presented they would hold their picture up and they would be able to see their notes. 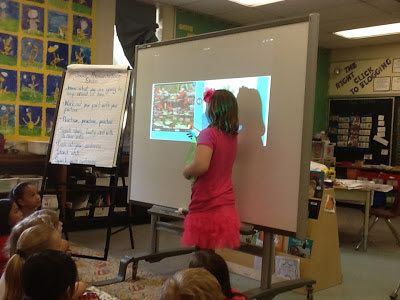 I had others that created books about habitats on the iPads using book creator and others that drew pictures in the app Show and Tell, then uploaded the picture into Explain Everything and recorded their learning that way. Some children chose to work alone, while others worked in pairs. Did I have a few students that needed help? Of course, however, out of 40 students, there was only a handful that need extra guidance. They truly amazed me. When it was time to present they stood up at the front of the class confidently and shared their information. The students that used the iPads used the Apple T.V with ease and finesse. The students that created posters spoke proudly about their projects. The common thread with all of these projects? It didn't matter how my students chose to share out their learning. They had all mastered the concept. In every presentation, the students answered the two essential questions. They were all successful! As I reflect on this process, I think there were many reasons why all of my students were successful at this task. 1. It was authentic. They had a real problem, "What does this toad need to survive in our classroom?" 2. It was something they were interested in. 3. They got to CHOOSE how they presented it. 4. Learning this way is FUN! My good friend Karen Lirenman feels very strongly about letting her little ones choose how they show their learning. She has written many great blog posts about it here. I want to give her a shout out....you are right again friend! There is no turning back now! I have gone to the other side and I just wish that I had done it sooner!